We propose a windward bi-frequency control strategy to manipulate experimentally the wake past a yawed car model using pulsed jets. By varying the low frequency value in the actuation, we can provide a complete authority for the manipulation of the mean wake orientation and reduce drag. This study deals with electrohydrodynamic interactions between two deformable droplets in a confined shear flow. We have investigated the effect of the channel confinement and the electric field strength on the droplet trajectories using numerical simulations. Two important varieties of motions are identified in the present analysis: (i) the reversing motion and (ii) the passing-over motion. This study suggests that conversion of the passing-over motion to the reversing motion or vice versa is possible by modulating the strength of the imposed electric field. Such a conversion of the pattern of droplet migration is also achieved by changing the electrical properties of the system (for instance, conductivity). Similar to the electric field strength and the electrical properties, the domain confinement is also found to play a key role in the conversion of the mode of droplet motion. Interestingly, the presence of electric field is found to prevent droplet coalescence to a certain extent depending on its strength, thus rendering the emulsion stable. Our results provide a perspective of electric field in a confined medium which can be used as a tool to modulate droplet trajectories in an emulsion. Inspired by the droplet-mediated adhesion of insects, the adhesion between soft and rigid surfaces mediated by a droplet is studied. Deformability allows for enhanced adhesion as well as new routes for “unsticking,” but the dynamics of adhesion also plays a role. Rapid magnetic resonance imaging shows how bubbles collapse in fluidized beds as a result of gas channeling to neighboring bubbles. Turbulent flows are often bounded by nonturbulent fluid with a sharp interface between the two flow states. Drawing a parallel between this interface and the wall in a wall-bounded flow and similarly, to wall-bounded turbulence, shows the importance of the anisotropy very close to the interface. We present an experimental study of water drop impact on an oil layer floating on a water bath. With the fixed oil layer thickness δ = 1 mm and viscosity μ = 10 mPa s, different phenomena are presented depending on the impact velocity. A regime map is built to classify these phenomena into bouncing, trapped, trapped + breakup, water in oil in water (W-O-W) particles, and multi-layered W-O-W particles. Focus is on the formation of the W-O-W particle which has a combined structure: a water globule enclosed by an oil film in the water bath. Generally, one intermediate-speed impact produces two W-O-W particles named as the primary and satellite particles, respectively. The diameter of the satellite particle significantly increases with the impact velocity, while the primary particle remains almost constant. There exists a maximal diameter of the satellite particle which is equivalent to that of the primary particle. After that, multi-layered W-O-W particles form and the satellite particle diameter decreases with the impact velocity. In the limit of an extremely thin oil film, a theoretical model is built to predict the threshold for generating W-O-W particles and the variation of the particle diameter with the impact velocity. Moreover, the threshold for generating W-O-W particles is found to depend on the oil layer thickness and viscosity. A qualitative analysis is presented to explain this phenomenon. The intensified flow dynamics by the second acoustic standing-wave mode, superimposed with vortex-excited acoustic resonances inside a channel with coaxial side-branches, were experimentally investigated. In the experiments, the frequency lock-on range of vortex-excited acoustic resonances was determined first by comparing wall pressure fluctuations and simulated acoustic standing-wave modes. The intensified flow dynamics by the second acoustic standing-wave mode were measured by particle image velocimetry (PIV); the flow dynamics were also measured when coupled with the first standing-wave mode for comparison. The results demonstrate that shear layer developments over the branch entrance can be classified into three regions, i.e., the developing region, the transition region, and the collapsing region. Both the momentum thickness and the growth rate of the shear layer were significantly intensified in the developing and transition regions by the second standing-wave mode. The subsequent spatiotemporal evolutions of the shedding vortex, recirculation zone, and synchronous flow streaks were identified by the phase-locked PIV measurements. With second-order acoustic modulations, the shedding vortex breaks away from beneath the recirculation zone to impinge the downstream branch corner while directly converging with the recirculation zone during first-order modulation. Finally, the aeroacoustic energy transfer between vortex dynamics with standing waves was revealed using Howe’s aeroacoustic analogy. The energy transferred from the standing-waves contributed to the formation and development of the shedding vortex, while the energy produced by convection and the collapsing of the shedding vortex maintained the standing waves’ propagations. The accumulated aeroacoustic energy produced during one second-order acoustic resonance cycle was found to be up to 150 times that produced during one first-order cycle. An innovative control device for the asymmetric flows over a blunt-nosed slender body is studied at a high angle of attack (α = 50°). The control device is composed of a micro-particle and a blowing device. Experimental tests are conducted to study the control of asymmetric flow. Particle-image velocimetry, surface oil-flow visualizations, and pressure scanning are used to present the vortical structures, flow separations, and pressure distributions. A blow hole with a diameter of db = 0.005D and a particle with a diameter of dp = 0.006D are placed on both sides of the nose as the micro-blowing perturbation and micro-particle perturbation (MPP), respectively, to control the behavior of the asymmetric vortices. The blowing coefficient (Cμ) through the blow hole is 0–9.42 × 10−5. Results show that a certain and predictable pattern of asymmetric flow is first presented at Cμ = 0, owing to the certain location of MPP on the nose. Subsequently, as Cμ increases, the asymmetric flow is changed into symmetrical first and then into the opposite asymmetric flow pattern. As a result, the corresponding side-force is changed into zero and then the opposite direction. These results indicate that the pattern of asymmetric vortices and their corresponding side-forces are easily managed by changing the blowing coefficient. The evolutions of associated pressure distributions, flow separations, and vortical structures with the increase in blowing coefficient are presented in detail. A study shows that when trained using channel flow data at just one Reynolds number and informed with known flow physics, the neural network works robustly as a wall model in large-eddy simulation (LES) of channel flow at any Reynolds number. 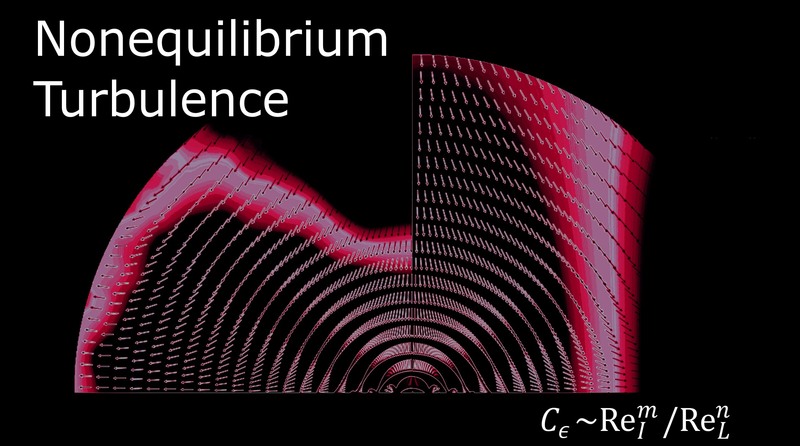 It also outperforms the equilibrium wall model in LES of a 3D boundary layer flow. The present paper investigates the relationships between non-acoustical parameters and sound absorption characteristics of the porous polyurethane foams based on the proposed simplistic unit cell model. The simplistic unit cell model, in which the inner shape of each unit cell is spherical and the nodes at the joint have a triangle concave cross section shape, is established from foaming process and scanning electron microscope (SEM) pictures of the porous polyurethane foams. The non-acoustical parameters and sound absorption characteristics of the porous polyurethane foams are expressed as functions of the geometric parameters of the simplistic unit cell model. The present predictions are in good agreement with the existing experiments and numerical results. Finally, the correlating relationships between the viscous and thermal effects and sound absorption coefficients of the porous polyurethane foams are discussed using the simplistic unit cell model. It is demonstrated that the simplistic unit cell model could describe the microstructure characterization and sound absorption properties of the porous polyurethane foams and the influence of the viscous effect on the sound absorption coefficients is more obvious than that of the thermal effect in the studied frequency ranges. The elastic stress generated moving in a purely viscous flow around a slender cylinder is found to be large near the tips, and larger when the flow is parallel to the axis. The effect of heat-flux conditions on the Rayleigh-Bénard convection in a rarefied gas is investigated, extending instability to higher rarefaction rates compared with the isothermal walls case. The deviation from the Boussinesq limit with increasing compressibility is analyzed. Evanescent regions exist in numerous areas of the deep ocean where the stratification also varies with depth. Using theoretical predictions and experiments, the kinetic energy density in propagating internal waves generated from these evanescent regions is explored. Evaporation of a volatile solvent induces solutocapillary Marangoni flows by creating gradients in species concentration and surface tension. These flows are experimentally and theoretically investigated in sub-micron films at dilute solute concentrations where Van der Waals effects are important. Chemo-hydrodynamic instabilities are investigated in the presence of nano-catalysts. The additional transport mechanism of nano-catalysts as a result of the heat of reaction, called thermophoresis, has affected both the dynamics and the amount of chemical products. Direct numerical simulation of a spatially developing supersonic mixing layer with a convective Mach number of 1.0 is conducted. The present work focuses on the structural evolution and the turbulent statistics, and both instantaneous and time-averaged data are utilized to obtain further insight into the dynamical behaviors of the flow. The full development process of instability, including the shear action at the flow early stage, the generation of kinds of typical vortex structures in the flow transition region, and the establishment of self-similar turbulence, is clearly presented. The formation and evolution mechanisms of multiple ring-like vortices are reported and analyzed using the Helmholtz first law in compressible mixing layers, and the role they play in the mixing process in the flow transition stage is researched. The mean velocity distribution and the turbulent intensities are found to have close relations with the evolution of the multiple ring-like vortices. The presence of multiple ring-like vortices leads to local strong ejection and sweep regions that create pockets of partially mixed fluid near the tips of the vortices, which contributes much to the huge energy and momentum transfer of the upper and lower streams. Some anisotropy coefficients and turbulent structure parameters are described and analyzed to better reveal the effects of multiple ring-like vortices on flow behaviors. Our results indicate that with the increase in compressibility, though in a fully turbulent region, mixing layer growth and turbulent intensities are both suppressed, the appearance of multiple ring-like vortices and their evolutions can significantly promote mixing in the transition stage, which is usually ignored by previous researchers. Therefore, employing flow control methods to extend the flow transition stage and help sustain multiple ring-like vortices over a longer distance is a possible technique to enhance mixing. Vortex shedding patterns are examined on a yawed wing pitching in reverse flow. The yawed wing exhibits suppression of its secondary flow structures compared to an unyawed wing. Various physical mechanisms, particularly spanwise flow, are evaluated to explain the shedding pattern of the yawed wing. Aircraft perform flight in multiple regimes with different speeds, Angles of Attack (AoA), sideslip angles, and at different altitudes. Designers usually choose the airfoil having the best performance for the cruise mode only or being able to stay suboptimal for all the flight regimes. It leads to a reduction in the maximum lift-to-drag ratio for certain regimes, as well as deterioration in the overall performance. That is why the adaptive wing with its ability to stay optimal for any of the flight regimes is a promising technology which could significantly improve the performance and maneuverability of the aircraft during the flight. In this work, we assess the performance of the wing with the traditional and adaptive mechanization of the flap and slat using computer simulation followed by the experiments in the wind tunnel environment. This work also provides the design of an adaptive wing with an adaptive flap and slat. All the investigations were performed for the two-dimensional airfoil under different Reynolds numbers and AoA. This paper demonstrates that an adaptive wing improves the lift-to-drag ratio and maneuverability of the aircraft for different flight regimes. The application of the adaptive wing mechanization could improve the lift-to-drag ratio by 20%-30% for certain regimes, thereby improving the range and time of operation.